Fenerbahce Ulker Istanbul registered its first win in the 2012-13 Turkish Airlines Euroleague by downing BC Khimki Moscow Region 92-80 in front of 8,400 fans at Ulker Sports Arena in Group A on Thursday. 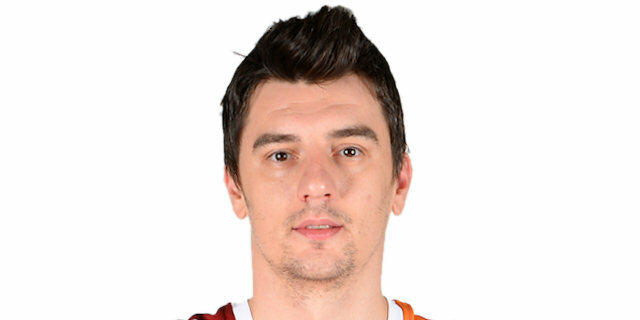 Emir Preldzic paced the winners with 20 points. Bo McCalebb added 17, Omer Onan had 15, Romain Sato got 12 while Oguz Savas contributed 11 for Fenerbahce. 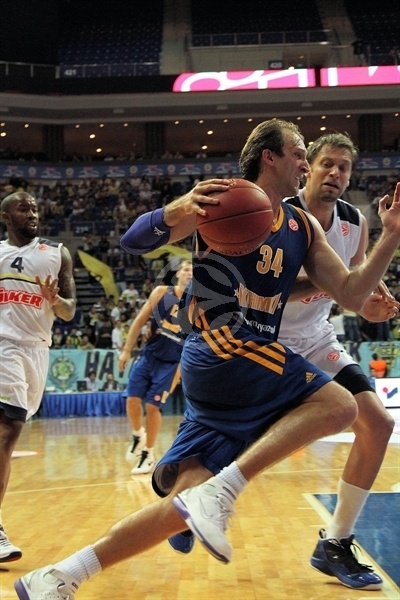 Zoran Planinic led Khimki with 17 points. K.C. Rivers added 14, Aleksey Zhukanenko had 12, Kresimir Loncar 11 and Sergey Monya 10 for the guests. A wild three-pointer by Rivers tied the game, 25-25, after 10 minutes. An outstanding Preldzic had 9 points in the second quarter and a jumper by Batiste gave the hosts a double-digit lead, 46-36, at halftime. Planinic brought Khimki within 45-41 after the break but Preldzic, Bogdanovic and Savas allowed Fenerbahce to get a 14-point margin, 72-58, with over 7 minutes to go. Khimki kept trying but Fenerbahce had cruised to a well-deserved home win. Vitaly Fridzon got Khimki going with a backdoor layup but Mike Batiste bettered that with a three-pointer to give the hosts their first lead, 3-2. Fridzon kept pacing Khimki with a jumper and Zhukanenko dunked it for a 3-6 Khimki edge. Sato stepped up for Fenerbahce and a fast break layup by Onan gave his team an 8-6 lead. Zhukanenko swished a mid-range shot and James Augustine copied him right after that to put Khimki back ahead, 9-10. Planinic grabbed a loose ball for an easy basket but Onan and Savas provided another lead change, 13-12. Rivers hit a jumper and Planinic scored again but McCalebb took over with consecutive baskets for a 17-16 score. 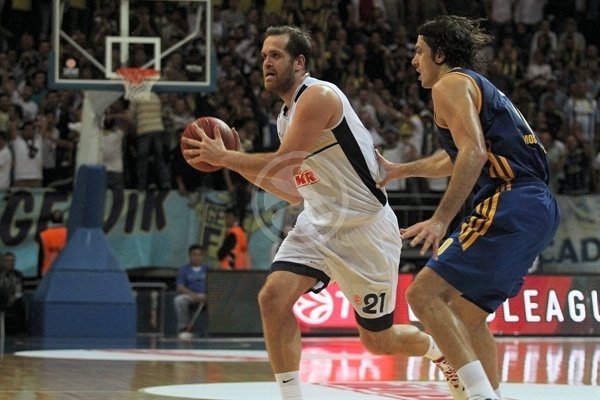 Bojan Bogdanovic and Rivers exchanged baskets but David Andersen nailed a corner shot to give Fenerbahce a 21-18 edge. Loncar scored down low and Onan erased that with a long two-pointer. Fridzon and Preldzic traded free throws but Rivers banked in a buzzer-beating three-pointer for a 25-25 tie after 10 minutes. Both teams struggled to score early in the second quarter until Planinic stepped up with a layup. Ilkan Karaman made free throws, as Fener tried to use Boganovic to guard Planinic. Preldzic took over with a wild driving layup but the hosts entered the foul penalty early in this period. Loncar fed Zhukanenko for a dunk and Rivers allowed Khimki to regain the lead, 29-30. Preldzic sent the crowd to their feet with an off-balance driving layup and a three-pointer that forced Khimki to stop the game at 34-30. Rivers banked in a driving shot but Savas matched it with a power layup and added a jump hook for a six-point Fener lead, 38-32. Zhukanenko hit a close jumper but an unstoppable Preldzic scored again and Batiste added his trademark hook shot in the paint for a 42-34 Fenerbahce lead. Augustine briefly silenced the crowd with a dunk but Onan quickly answered with a jumper and Batiste added a long two-pointer to make it a double-digit game, 46-36, at halftime. Zhukanenko hit a close jumper right after the break and Planinic buried a stop-and-pop three-pointer to bring Khimki within 46-41. Sato immediately answered from downtown but Augustine nailed a five-meter jumper and Planinic sank a six-meter shot to make coach Simone Pianigiani call timeout at 49-45. Khimki stayed aggressive on defense, not allowing any open shots. Even with that, Sato provided a highlight with a wild jumper to give Fenerbahce some fresh air at 51-45. McCalebb beat the shot clock buzzer with a one-handed jumper in the lane and a tip-in by Sato made it a double-digit game, 55-45. Rivers sank an off-balance jumper but Preldzic and Karaman soon gave Fenerbahce a 58-47 margin. Monya shined with a two-handed slam but Preldzic swished a four-meter jumper off the dribble. 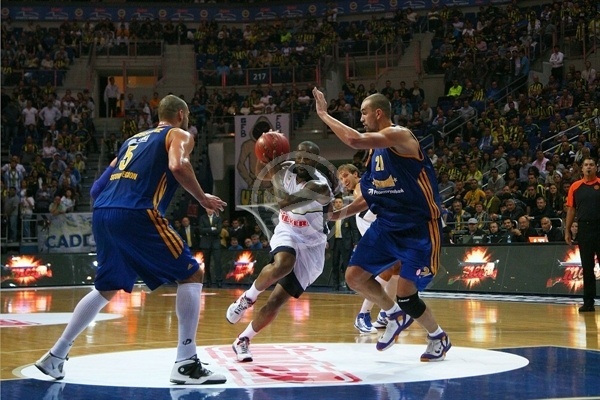 McCalebb scored around the basket but Loncar singlehandedly kept Khimki within 62-54 at the end of the third quarter. Fenerbahce tried J.R. Bremer at point guard to make the most out of his driving skills. He fed Savas for an easy basket and Bogdanovic added a power basket in transition for a 66-54 Fenerbahce lead with 9 minutes to go. Petteri Koponen hit a floating layup that Savas bettered with a three-point play. Koponen insisted with free throws and back-to-back three-pointers by Monya gave Khimki some hope at 72-64. McCalebb sent the crowd to their feet with an outstanding driving layup that Rivers matched with a jumper. Onan hit his trademark off-balance shot in transition - and the free throw that came with it for a 77-66 score. Preldzic made foul shots and Sato buried a three-pointer but Planinic answered with a rainbow shot in the paint. 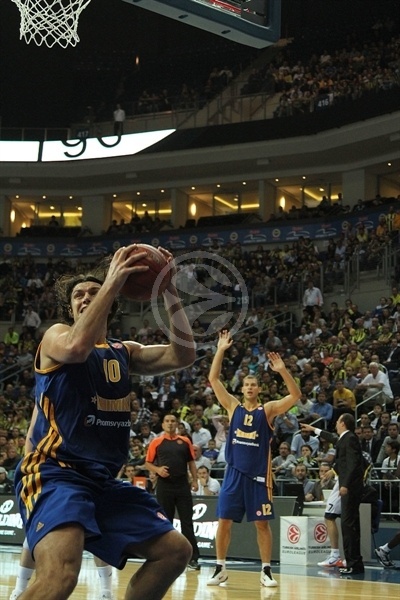 Khimki was in the foul penalty, however, and Fenerbahce took full advantage of that. Free throws by Preldzic and an off-balance shot by McCalebb sealed the outcome, 86-70, as Khimki could not recover in the final 3 minutes. "Everyone knows that the Euroleague is very important. The atmosphere tonight was very good. Currently we're not as good as we hope to be, but the players looked very good, especially for the first game. We fought. In the last quarter, we had some shortcomings. We allowed the most points in the fourth quarter. Perhaps the reason for this may be that we are a newly formed team. Khimki’s players recognize each other because they continue from last year's teams. In the fourth quarter, we were not at the desired level due to fatigue." "Great game for us. The first five minutes, and the last five minutes of the game were not good enough, but the rest was pretty good. So we have to solve those problems that happened in the beginning and at the end of the game, and then I hope we can play even better than what we did tonight." "The first half was good for us and after the long break we stopped playing defense well against the pick-and-roll and started to lose under the boards. 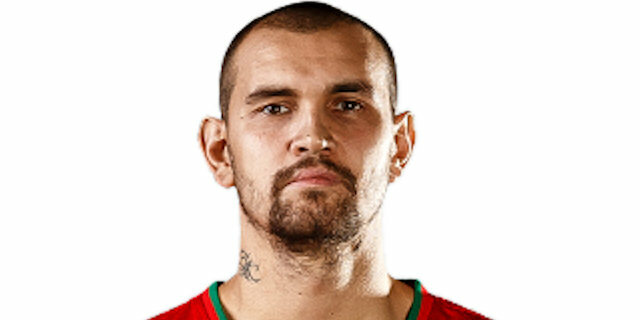 We are waiting for Paul Davis to recover; he is a very strong cente rand he will help us with rebounds."